Eight of us drove again toward Mount Mulange including an Ethiopian pediatrician who was mostly raised in the US, studied at UCLA and is now taking some time to travel in Malawi and Ethiopia and perhaps elsewhere to also work in clinics where she may be needed. We got lost on the way to the mobile health clinic at Misango because a bridge was out and the diversion was not at all marked but the silver lining was that we drove through a very remote and densely populated area of 16 or so villages where apparently not many azungo (white people) travel and we have never gotten so many smiles and waves, even from adults and adolescents, and the children were absolutely beyond ecstatic and excited and frantically waving while jumping up and down as if they just could not get enough of seeing our unusual skin. We finally made it to where the clinic was operating on a Monday in a small church with concrete floor and built in benches where again the people welcomed us with song although relatively few sang as most were simply amazed and not to speak of not feeling well. Some had begun walking from their homes at 4:00am and had been waiting since 6:00am for the medical staff. We all went inside the church and were introduced with Bill making a short speech about our wish to be their sisters and brothers and that we wished them well. We then split among a few who sat with the medical officer, a few with the 2 nurses who were entering medical data in each person’s medical passport and the government and clinic records using carbon paper (! ), and then a few were writing down people’s stories with Alice interpreting. The nurses explained what they were giving to the patients and we could see each small plastic bag marked with the medicine’s name and a visual of how often they are to take it as marked by boxes showing morning, noon, evening sun and the moon. Apparently, many people come to the GAIA clinic because the government clinics are more often out of the medications and also require a long walk. ARVs must still be secured from the government clinic which is a very long walk away taking maybe 2(?) hours or a Kw 250 but otherwise, the people prefer the mobile clinic. The very small children still in their mothers’s infant sling were terrified of us since our skin looked so pale. One child looked at us twice and burst into frantic crying which made the mother laugh and she could only appease him with her breast. Others were less vocal but still did not like our looks! After an hour at the clinic where about 25 villagers were seen by the MHC staff, we left and actually found a wood fired pizzeria with delicious pizza in a close-by town. Then we went back by the tea plantations from a few days ago to the 3 villages supported by St Luke’s parish in Darien, CT. Again we were sung and danced into a gathering where we were seated in front of villagers, this time the caregivers and orphans from 3 villages recently added to the GAIA villages program. Most of the 296 orphans who inhabit these 3 villages seem to have been there as well as their 105 caregivers, 2 coordinators and hundreds of other villagers of the 6,398 populating this area. The program to which we have become accustomed unfolded with opening prayer, introductions of the chief and of the Americans, heartfelt thanks of a grandmother who GAIA has helped support the orphans she cares for, and AIDs patient who is grateful for the support, and 2 dances, the second of which we were encouraged to join which we did! The chief of one of the villages, a wise woman, gave a well thought out speech about how glad they are that GAIA is now there since they saw our work in the neighboring villages and feared we would never come but here we finally are! The villagers laugh and clap when we really get into it as one foe our group does very well – it is a wonderful way to enjoy each other cross-culture through dance requiring no verbal communication! After the program closed with a prayer, we went to visit a home based care patient, a mother aged 38 with 4 children, one of whom is still nursing. 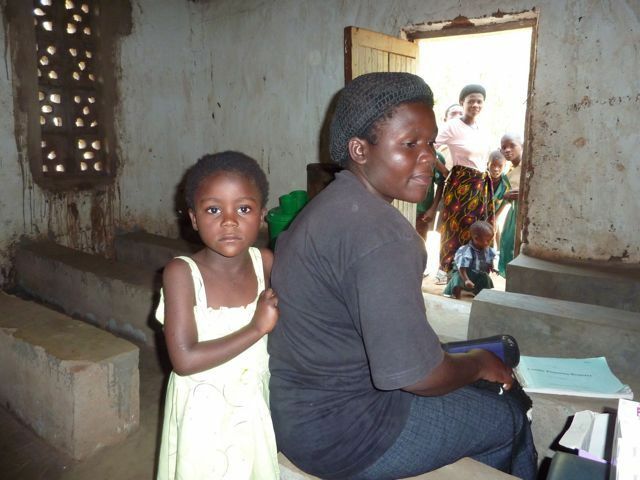 Her husband left her with the 4 children when he found out she was HIV+, he would not get tested, and she struggles to feed the family despite some help from her sisters. She has a bad case of kaposi’s sarcoma which is especially bad on her right leg and causes her much pain. 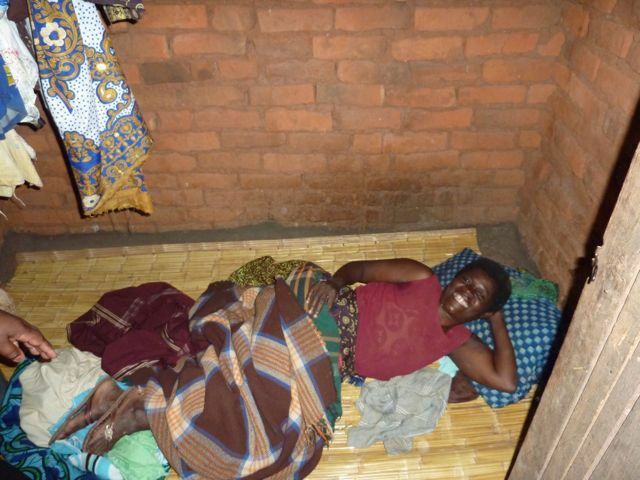 Despite this, she feels that she is better now that she is on ARVs from the government clinic. She shared her story with us willingly and we asked her many questions – her life is very, very hard. Before GAIA she had absolutely no support with feeding and meds. Our senior staffer, Alice, then took a few of us to Ester’s home as I had requested if we could possibly see the inside of someone’s home including living area, bedroom, storeroom, adjacent kitchen and bathing area. Ester, a widow of several years, was thrilled to show us her home which was all dirt floors, well swept to a hard pack in order to keep dust down, and all in all well organized with her few belongings. The inside is very dark as there are no windows but it was fresh and tidy. The bathing area was brick lined with woven privacy walls and a large bucket for water. 2 toothbrushes were stuck in the woven siding for easy access! The kitchen is separate so there is no smoke inside. The smoke from the kitchen fire escapes through the door and 2 small open spaces in the hut wall when she cooks with her pot resting on rocks. This was an emotional day as the remoteness of these villages meant that so many were exceedingly poor and yet needing to care for so many orphans left with no one. Also the unfamiliarity of the villagers with azungas (white people) and even the relative progress outside of their remote village felt especially desperate and deeply sad. The 4 americans in our car fell into a deep sleep on the way home – it was a lot to take in and difficult to make sense of it all in the context of the modern world from which we come. 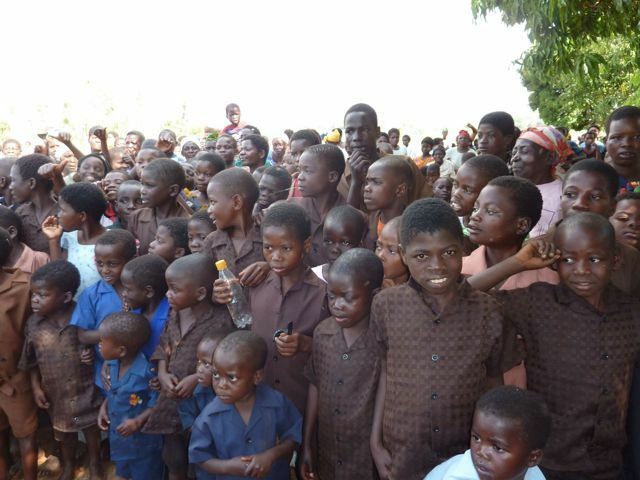 This entry was posted in Uncategorized and tagged AIDS, GAIA, Malawi, St. Luke's. Bookmark the permalink. Thank you for the work you, your team and GAIA are doing to make a profound difference in the lives of the people of Malawi. My friend, Joy Mistele, forwarded the link to your blog. Thank you for posting the details of your trip and allowing us to travel with you. I am moved, humbled, inspired and hopeful. I look forward to learning more when you all return. Travel safely.